Anyway, the four of us were safari-ed out and half asleep when Joseph, our guide and driver, spotted some lions by a watering hole just off the road; the other Serengeti Pride vehicle with five more of our gang was already there. A male and female were ambling about a watering hole and four more females (the male looked very tired) were overlooking the scene from a hill above. One of the lionesses moved before I could get the shot I wanted, which would have been very Mount Rushmore-like, but it was still an unexpected way to finish off our five days looking for animals. But that’s the way it goes on safari, you have to be lucky and find yourself in the right place at the right time. Our itinerary took us to three very different locations: Lake Manyara National Park, the Ngorongoro Crater, and Serengeti National Park. We visited Lake Manyara the first afternoon; the area around the lake is heavily wooded and home to a wide assortment of birds and animals. 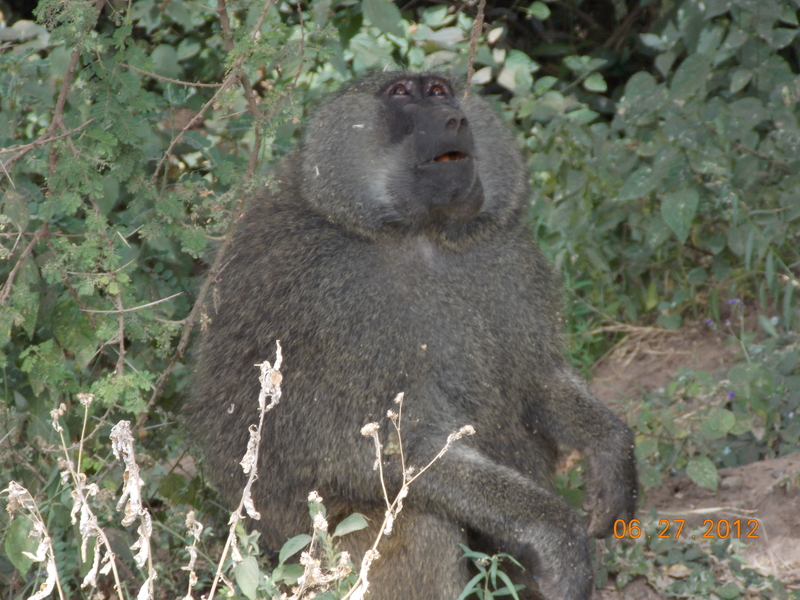 You see baboons everywhere, often screeching and fighting in some kind of turf battle, always a lot of fun. The safari vehicles have a roof that rises up so you can stand and take pictures, and apparently the day we were there a baboon jumped into one of the vehicles and onto the lap of a young kid. The animal removed the kid’s glasses, determined they weren’t edible, grabbed a bag of chips and took off. That kid’s going to have a pretty good “what I did on my summer vacation” story when he gets back to school! We had a couple of elephant sightings that first day, and at one point a fairly large group of them came out of the woods and sauntered across the road right behind our truck. No matter how many times you’ve seen elephants in zoos or circuses, it’s still quite remarkable being with them in the middle of their world. The highlight of the whole safari experience for me was the Ngorongoro Crater, where we spent the entire second day. The Ngorongoro Conservation Area is over 8300 square miles and its centerpiece is the Crater, a massive eco-system self-contained within the walls of this extinct volcano. We drove up to the rim of the crater and it was cold and foggy, rendering the scenic overlook useless, but as we headed down inside it cleared and we were amazed at the enormity and beauty of the place. You start out seeing a lot of zebras and wildebeests; it’s not long before you realize that the zebra and the wildebeest have to be the least endangered species on earth. 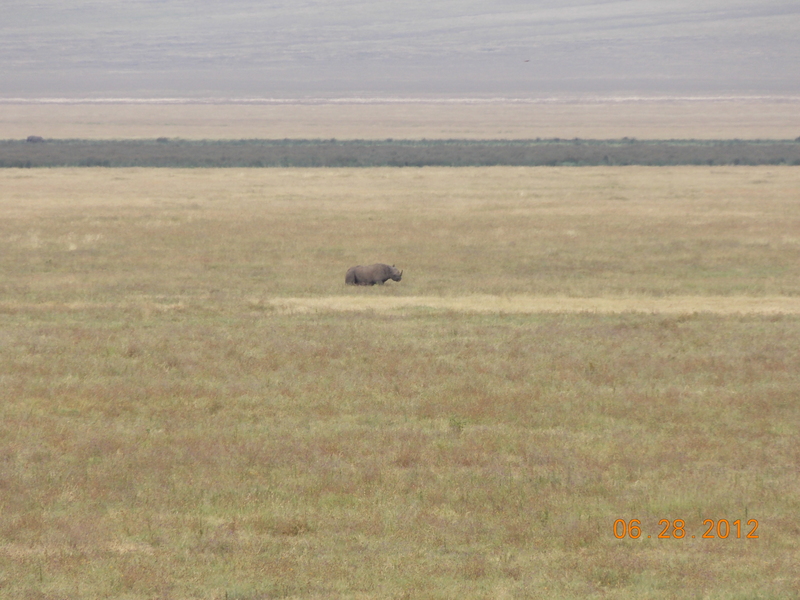 But from a distance we did see one of the most endangered: the black rhino. The biggest problem in maintaining the population is poaching; in some circles a black rhino horn can fetch up to $50,000. In the Middle East the contents of the horn are believed to be a powerful aphrodisiac, and in parts of Asia it’s believed it will cure many diseases, even cancer. The poachers are sophisticated – they have helicopters, night-vision goggles, etc. — well-armed and relentless, but they are not the only challenge. Black Rhino are loners, and often when females are fertile there are no males around. 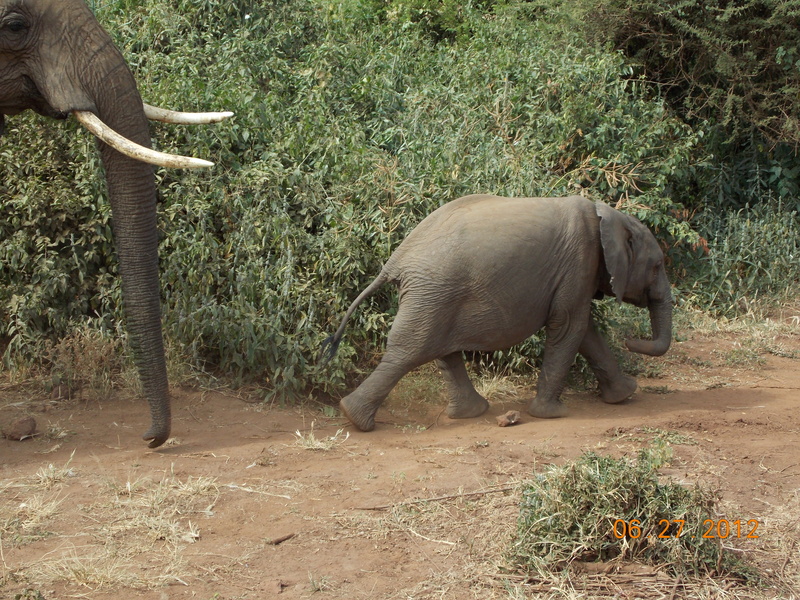 When females do get pregnant the gestation period is long, and it takes six years to raise a calf. And they also have problems with disease. There are ongoing efforts to deal with these issues but it’s an uphill battle. 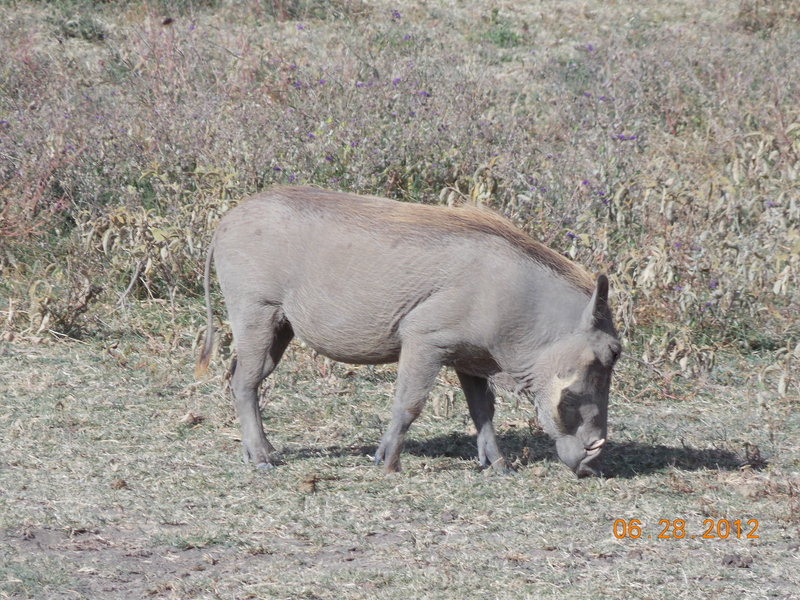 There are an estimated 25,000 large animals in the Ngorongoro Crater, and we ran across at least one of every variety. 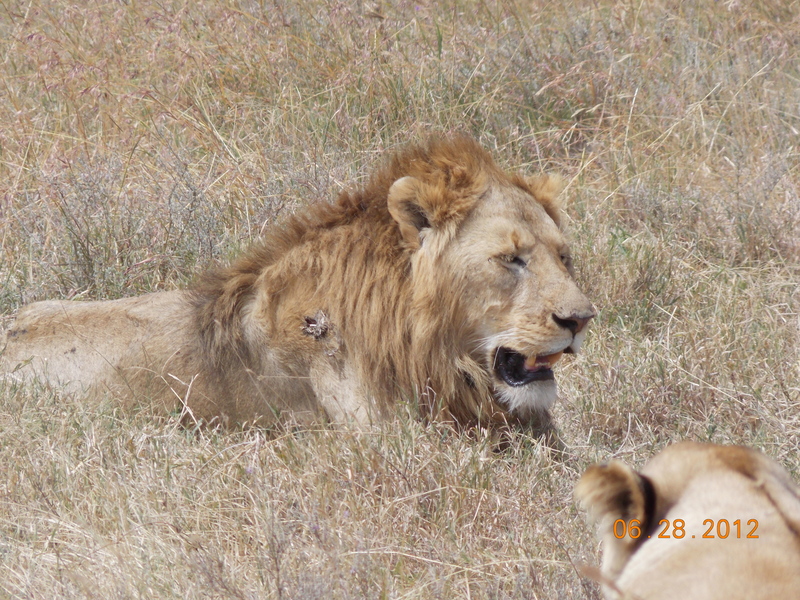 We saw a number of lions, several of them very close up; a female wandered in between the vehicles that had gathered before lying down in the shade of one of them. Joseph gave us a challenge: name the five biggest animals, five smallest, five ugliest and five most beautiful. Biggest: hippo, rhino, buffalo, lion and elephant. Ugliest: hyena, wildebeest, warthog, can’t remember the others. Warthog got my vote, not a handsome animal. Most beautiful: cheetah, leopard, giraffe. Smallest: the only one I remember is the elephant dung beetle. We were all hoping for the breathtaking thrill of seeing a migrating herd of elephant dung beetles. On the way to Lake Manyara the first day, and then on subsequent days throughout the Ngorongoro Conservation Area – except within the crater – we saw many members of the Maasai tribe, proud and noble, tending their cattle. Although spread over many hundreds of miles they are one of the smaller tribes and one of the most isolated. Only 20% speak Swahili, which 50 years ago was designated as Tanzania’s common language to insure all citizens could communicate. They live in small, circular villages, in homes built by the women and made of mud and sticks and dung. The sheep and goats are brought into the center of the village at night for protection from lions. A Massai warrior’s net worth is measured in the number of cattle he owns, and the more cows he has, the more wives he can attract. The chief of the Massai has 40 wives and 400 children, quite a workforce. The three stages in a Massai male’s life are boyhood, warrior and elder, and the transition from the first to the second is strenuous. After circumcision, which a young boy must endure without flinching, he goes into the bush with an elder to study. Then in his mid-to-late teens he dresses all in black with a painted white mask and ostrich feathers, and has to stay away from the village until he has proven his worth. We saw a number of these kids by the side of the road, fearsome and defiant, demonstrating to passersby their readiness to become warriors. I wish I had a good picture of them to show you, they are an extraordinary sight, but if you point a camera at them, they point a spear at you. On the way to the Serengeti we stopped at a Massai village. 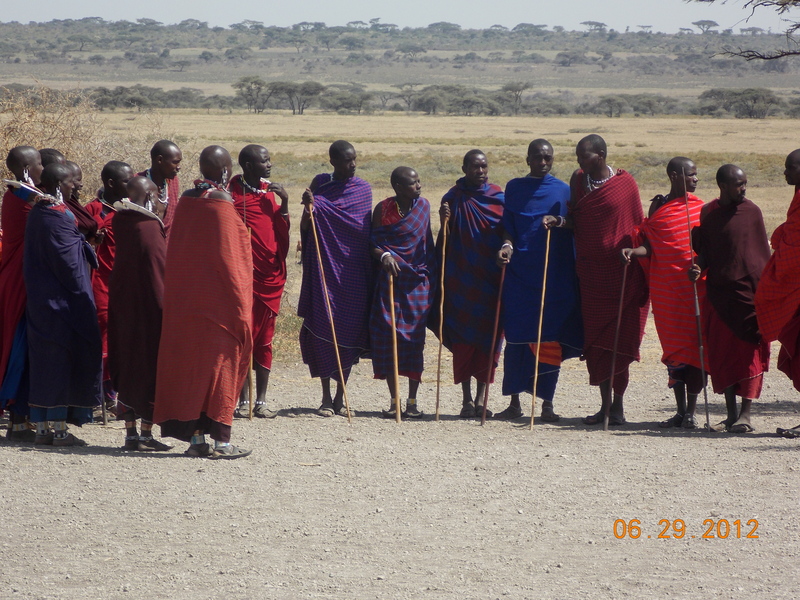 Now there are traditional Massai, but there are also modern Massai, and these guys were definitely modern — several of them speaking very good English — not to mention capitalistic. 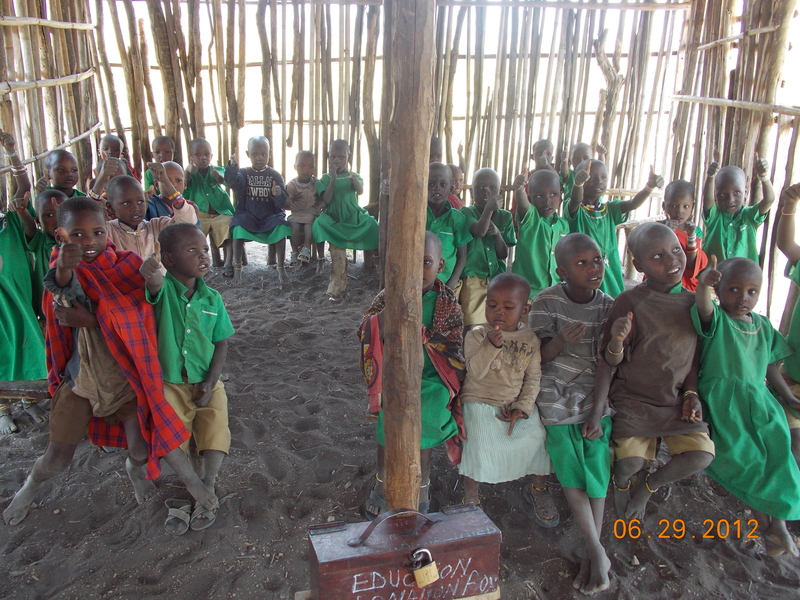 We paid $20 each for the privilege of seeing some dancing, sitting in one of their homes, and visiting a kindergarten class. The kids were well rehearsed, giving us the “thumbs up”, and I loved that one guy in the back row was wearing a Dallas Cowboys shirt. On cue they counted to 20 in English, and when we dropped a coin in the donation box they all cheered. Even though they were in on the show they were absolutely adorable, and when one of them moved over on his little bench and beckoned me to sit next to him, he absolutely won my heart. We all agreed the experience was worth the $20. 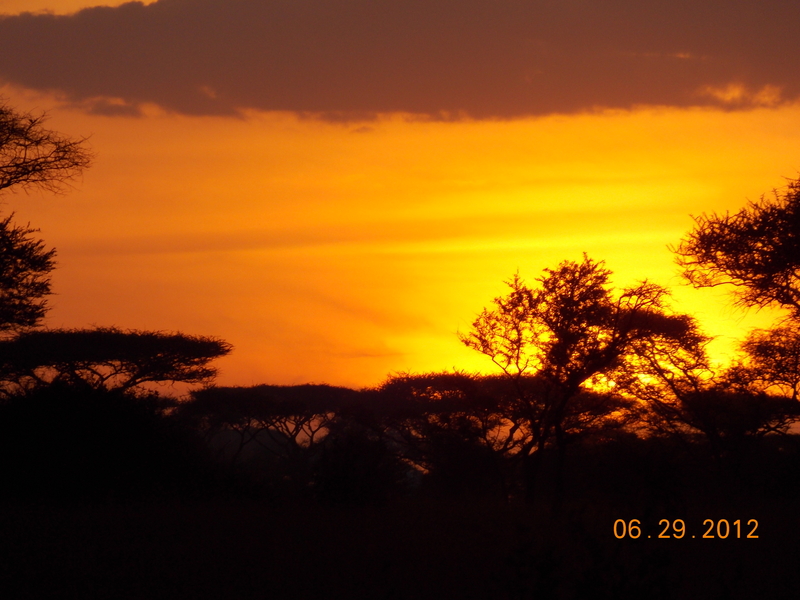 We were staying in a tented camp, of which there are many in and around the park, and we arrived just in time to witness a magnificent Serengeti Sunset. The day before we had learned that a Dutch tourist had been murdered by thieves at one of these camps, by a gang of 12 guys who were eventually captured. Joseph didn’t really want to talk about it; he and his guide mates know how detrimental something like that can be to their livlihood. “It will never happen again,” is about all I could get out of him. But our camp had very sophisticated security. I left the dinner tent for a moment the first night to grab something back in my tent, and out of nowhere a bushman with a bow and arrows was at my side, accompanying me down the path. I don’t know if he’d have been much good against 12 thieves, but he might have distracted a lion. We all joked that he probably had a .357 Magnum under his robes and that the bow and arrow were just for show. 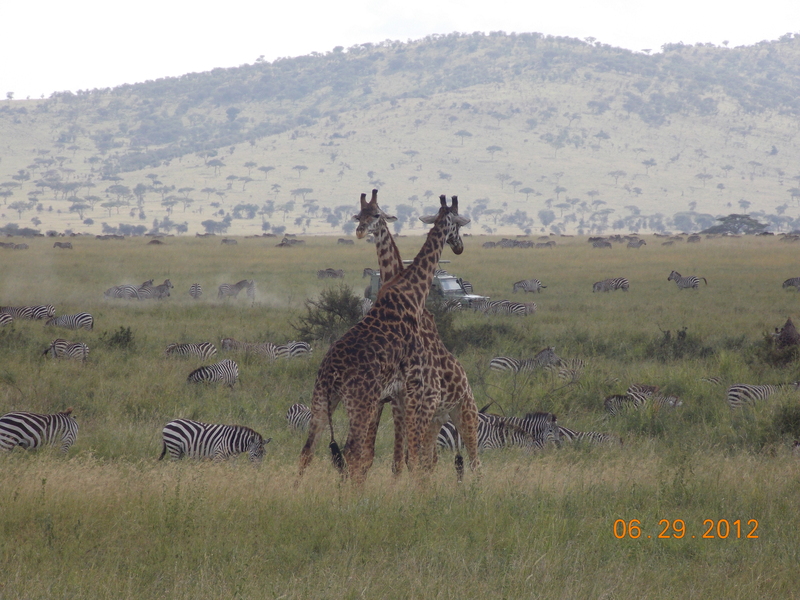 I had romanticized the Serengeti and was very excited to see it, but in truth preferred the Ngorongoro Crater. You go to the Serengeti to see the cats that you can’t see in the crater, specifically leopard and cheetah. We saw two leopards sleeping in a tree, and two cheetahs sleeping underneath one. But we had a lot of amazing experiences with elephants, giraffes, hippos and lions. The communication network among the guides with all the different companies was remarkable; wherever there was a sighting of interest the word spread quickly and many vehicles would soon gather. At one point our vehicle came across a dead zebra in a small, depressed area by a bridge. Then we spotted a female lion about 75 yards away, then another female, then five cubs. One of the adults started ambling toward us, and we were convinced we were in for some good flesh-ripping National Geographic stuff when she got to the zebra. About this point we looked around and there had to be 15 safari vehicles in a semi-circle around the site; I never even saw Joseph make a call. Anyway, the lion came over and sniffed the zebra, but wouldn’t touch it. The cubs climbed on it, but they all quickly moved on toward a herd of live zebra, who saw what was going on and hoofed it out of there. 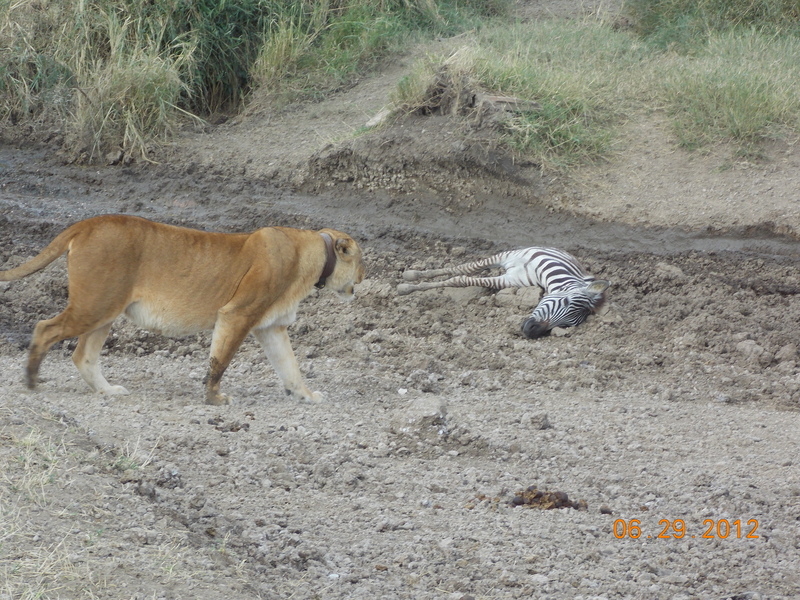 The guide network reported later that the zebra had been killed by a snake – either cobra or black mamba – and the scent of the venom is what turned the lions away. 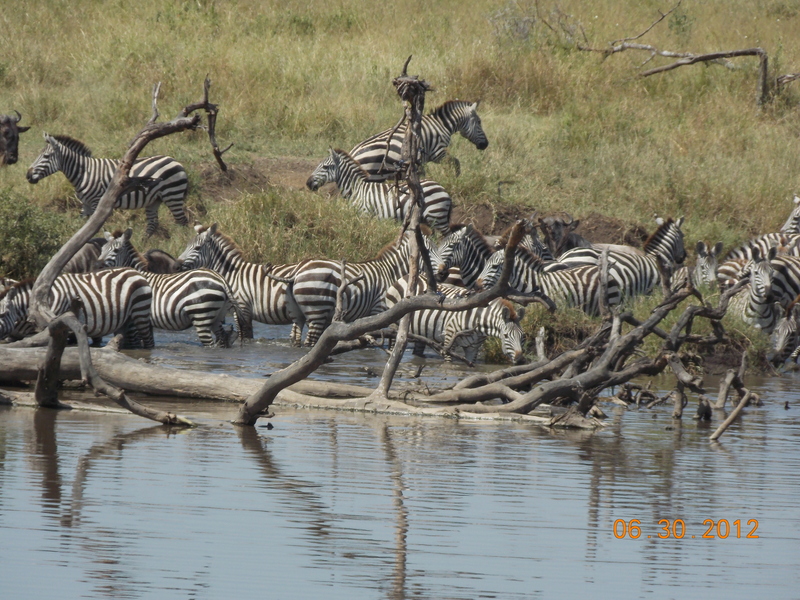 I thought that we would completely miss the Great Migration, but it turns out we were in the Serengeti for the tail end of it; some unexpected rains had reduced the urgency for the zebras and wildebeest to head north. We saw literally thousands of both species, in no particular hurry, huddling under trees during mid-day, wandering slowly north as it cooled off. The sheer numbers were staggering; I can’t imagine what it would be like to see the bulk of the herd. It will be interesting to spend a few days in Kruger National Park in a couple of weeks and compare it to our experience in Tanzania. It will be difficult to equal of the beauty of the Ngorongoro Crater, or the uniqueness of seeing a majestic Massai warrior with a goat in one hand and a cell phone in the other. Ruffin, keep up the detailed stories! It is fascinating and I so enjoy reading your stories. Wow, what a wonderful adventure! Thanks so much for sharing. I’m wondering if you know what the Massai use to shave their heads? Handmade tools or Gillette? Just curious as to how much commercialism has seeped into their lifestyles. Please keep the great stories coming. I’m living the adventure vicariously through your blog. Thanks! These pictures are awesome, Ruffin! I’m so glad you’re having a good time! What an incredible experience. Babu – LOVE the photos…makes one very much want to see what is to the right and left of each shot – vistas I only dream about! Keep your stories coming…I am passing them along to all I know.